Part of FRODOSpec on optical bench before shipping to site. 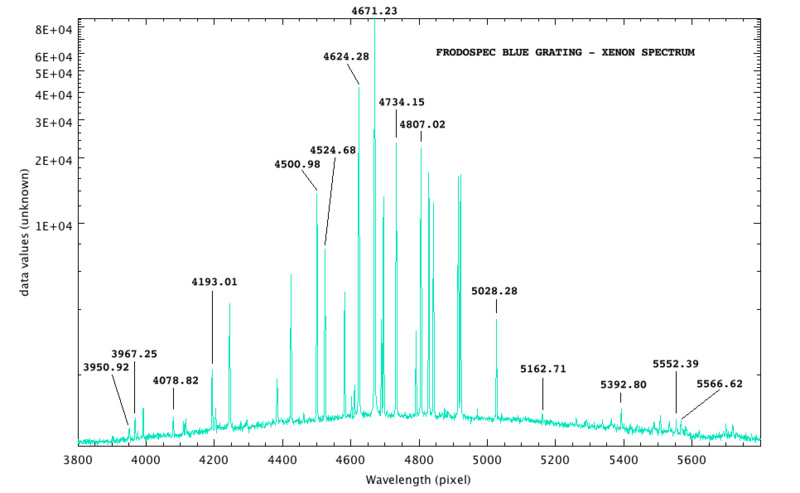 FRODOSpec (Fibre-fed RObotic Dual-beam Optical Spectrograph) is a SRIF collaboration with the University of Southampton to develop a multi-purpose integral-field input spectrograph for the Liverpool Telescope. As the name implies it is a dual beam design with the beam split before the entrance to the individually optimized collimators. Two resolution options are available on each arm. 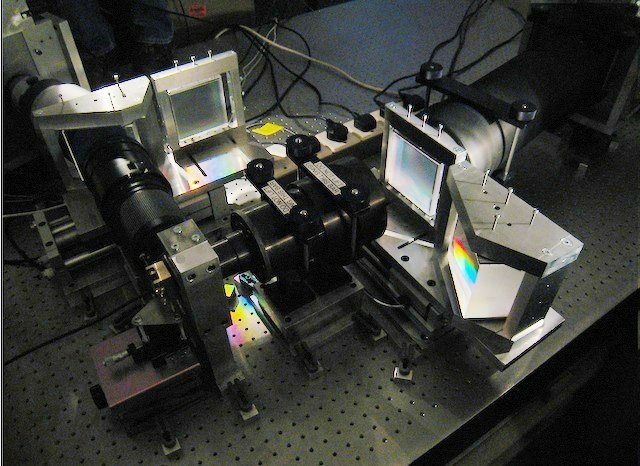 With low resolution selected on each arm, the entire spectrum from the blue cutoff of the optical fibres (around 3800 Angstroms) to the red limit of the detectors at around 1 micron can be obtained in a single shot. The low resolution is implemented using conventional transmission gratings. The higher resolution option for each arm is provided using a VPH grating bonded to a prism in order to throw the beam to the same angle as that obtained using the diffraction grating at low resolution. The central wavelengths in this configuration are fixed (centered around features of astrophysical interest). The spectrograph is bench mounted on the observing floor of the telescope enclosure and is fed using a fibre bundle from the Cassegrain focus of the telescope. An integral field unit using a microlens input array feeds the fibre bundle. 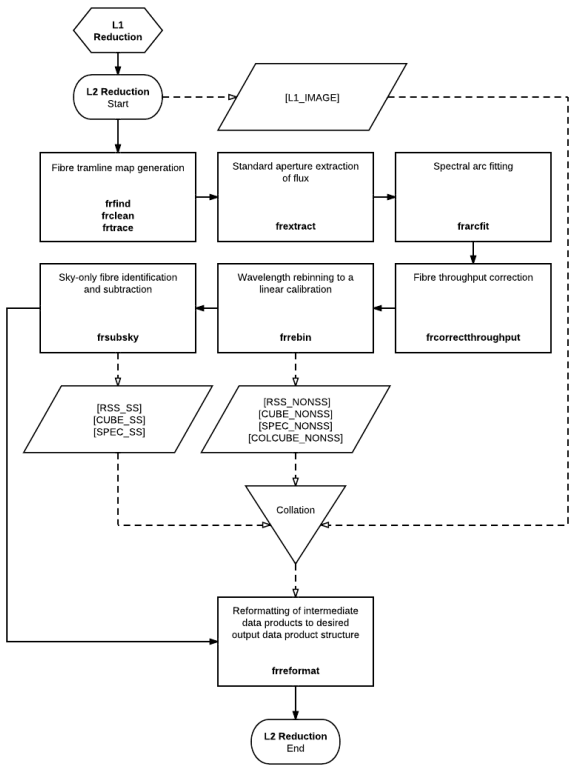 The following sensitivities have been measured using the engineering arrays, and so provide a conservative estimate of the final sensitivity of the instrument suitable for preparing proposals for the next Semester. The sensitivity figures below are zeropoint magnitudes, calculated in the AB magnitude system to get one detected photon/second/Angstrom. Alternatively, users may now use the Spectroscopy Exposure Time Calculator. Starting 9th June 2010, tungsten lamp flats have been obtained automatically every night and are used for all level 2 pipeline reductions. Prior to June 2010, pipeline reductions were performed using the twilight sky flat fields which are available here to download. The provided flats are a mean of 5-7 frames taken on the same night and have been passed through the same data reduction pipeline as the science data, so have been cropped in the same way. 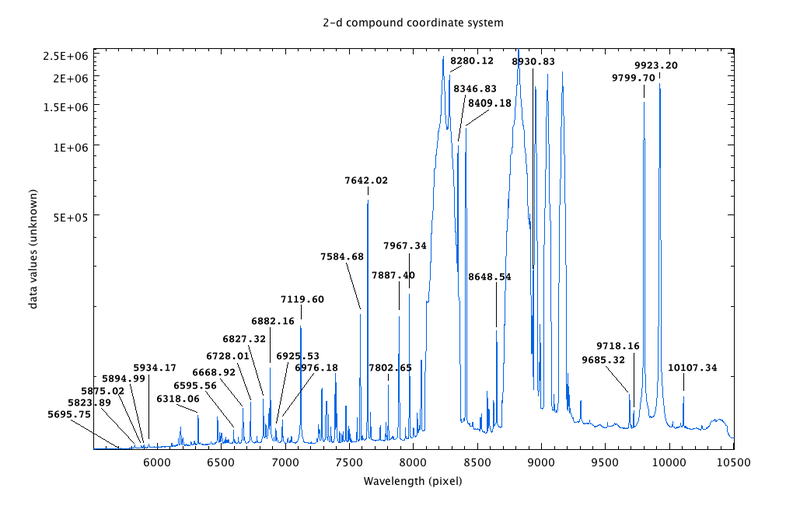 These provide a means of tracing the fibre positions in the 2D spectra for early data which are only avaiulable in the data archive as level 1 reductions. Two modes of acquisition onto the spectrograph are provided. Each relies on using an imager to fine tune the telescope pointing and place the target precisely in the focal plane so that it will lie on the FrodoSpec IFU. In this mode you must provide accurate (within 1-2 arcsec) J2000 coordinates for your target. Just picking the coordinates listed by SIMBAD will often not be good enough. If you do not have recent high quality astrometry already, consider checking it with a brief shapshot image (e.g., 10 sec, binned 2x2, r-band on IO:O) of your field first before investing your time allocation in long FRODO integrations. For "WCS FIT" acquisition, a frame is obtained first using the imager (e.g., IO:O) and a WCS fit carried out using USNO-B2 and 2MASS reference catalogues. Assuming the fit is successful (i.e. there are sufficient, and bright enough, reference stars found), then the telescope will be offset to move the supplied coordinates onto the reference pixel, and another image taken to confirm the offset was correctly applied. The process iterates until the requested coordinates lie accurately (&pm;2arcsec) on the reference pixel. It is important to note that for targets which are brighter than around 8th magnitude in the USNO catalogue (i.e. not for outbursting objects which are normally fainter than this) the USNO catalogue will contain an exclusion zone around the target from the saturated photographic plates which means that this method could fail. For such bright targets use BRIGHTEST acquistion mode. You must supply J2000 coordinates. In this mode an acquisition frame will be obtained using the imager and the telescope offset to place the brightest object on the frame at the reference pixel and another image taken to confirm the offset was correctly applied. This mode is generally used in situations where the WCS would fail due to catalogue incompleteness due to bright sources in the field. For this to work, your target must be the brightest source within one full field-of-view of the acquisition camera. I.e., if using IO:O then there cannot be any brighter source within 10arcmin of your target. The acquisition process moves the target onto a "magic pixel" on the imager CCD. The location of this pixel varies slightly whenever the imager (or FRODOSpec fibre buindle) is taken off the telescope. However, with IO:O it should usually be close to pixel 1110,939.5 (in 2x2 binned IO:O acquisition images - currently the default). Targets should thus be located on or very close to this pixel in the final acquisition image obtained just before spectra are acquired. Note that all acquisition images are made available to the user. The default and recommended choice is the primary science imager, currently IO:O. Other instruments can be used as acquistion cameras in certain cirumstances, but we suggest contacting us if you think that may be necessary for your observations. One example might be that you want to use BRIGHTEST acquistion in which case the smaller FoV of SPRAT makes it easier to ensure your target is the brightest thing in the frame.